Rossana I is a large ceramic box with golden finishes and brass lid designed by Cristina Celestino, and it is part of Dolce Vita, a collection that celebrates in a contemporary tone the charme of Italy in the fifties in which you could taste the beauty of the objects and the practices related to them. The collection includes items that belong to an ironic way of life, related to an idea of sophistication and elegance. Rossana I is available in three colors versions: blue, Ivory and red. Dolce Vita also includes Rossana II, a smaller version with the same design. Beautifully proportioned eight six-sided brass box. 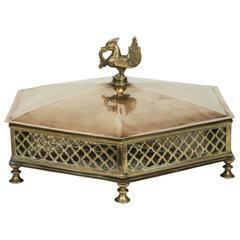 Lattice sides, a domed lid, footed base and a bird finial all work together to make a stunning box that is beautiful and utilitarian. 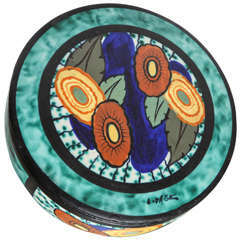 A colorful hand-painted lidded ceramic box depicting an Art Deco abstracted floral decoration by Louis Dage. 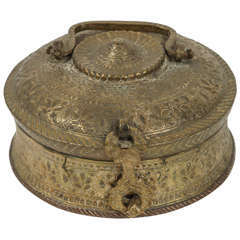 Brass Pagoda lid box, circa 1975. Recently shined and lacquered with a black felt interior along with pads on the feet. 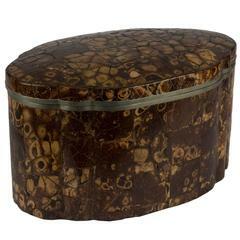 Large lidded tortoiseshell box with metal framing, 20th century H 9 in. ; W 16 in. ; D 10 in. Green ceramic trinket box with fish motif lid - a perfect spot for small jewels, mens clips and change. A great gift for dad or the office. and perfect for the dressing table or vanity.